This is essentially an iron carbide Fe3C (of almost constant composition). It is extremely hard in nature and brittle, being harder than ordinary hardened steel or glass. 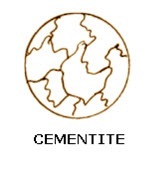 Cementite increases with the proportion of carbon present, and the hardness and also the brittleness of cast iron is believed to be due to the presence of cementite in it. It contains 6.69% C and has a complex rhombic lattice. It is weakly ferromagnetic below 25°C, but loses this property on heating to 210°C. The melting temperature of cementite is difficult to determine, since cementite decomposes on heating. In experiments with laser-beam heating, its melting point has been measured to be 1260°C.